Organic Prairie is a retailer of organic, farm raised meats, ranging from chicken and turkey, to pork and beef. 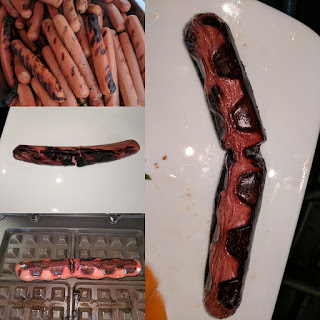 Their selections span from items like steaks and burgers, to bratwurst and hotdogs, to sausage and bacon, to even items like spiral cut ham and ribs, along with ground meat of all varieties (turkey, chicken, pork, beef, etc). But those aren't really the type of foods I review, are they? No, but snack foods are. 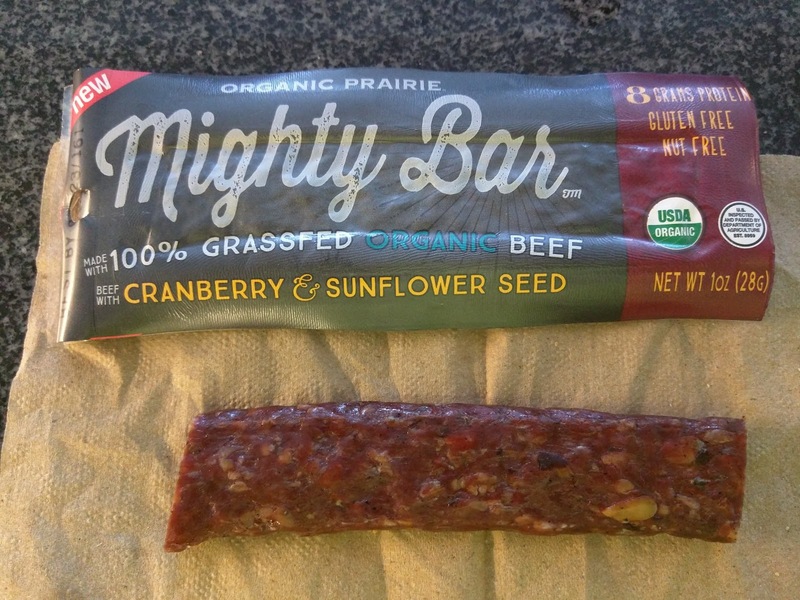 The only shelf-stable product Organic Prairie makes is "Mighty Bars", basically, really fancy Slim Jims, available in two varieties. I've tried both. Uncured Bacon & Apple Packaging. "Organic Prairie Mighty Bars are hearty, delicious, protein-rich meat bar snacks made from 100% grassfed, organic beef. These wholesome, healthy pick-me-ups are conveniently packaged for busy, on-the-go lifestyles." Meat bars. Like I said, basically fancy Slim Jims. Except not slim. Hmm. They are individually packaged, with labels boasting all the buzz words (grass fed, organic, yadda yadda). The bars are shelf-stable, no refrigeration required. Uncured Bacon & Apple - Back. The back of the packaging is clear, so you can see the product. 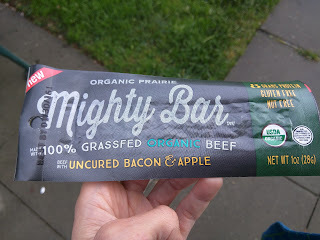 Don't mind the bite taken out of this one, I took a bite, not really expecting to write a review of these, because I don't really review meat sticks, but, uh, it was really good, so I changed my mind. 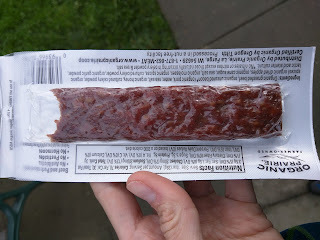 Yes, it was a dried meat stick. No, this isn't the sort of snack I normally gravitate towards, but, sometimes you just need some protein, and want something savory. And this totally fit the bill. 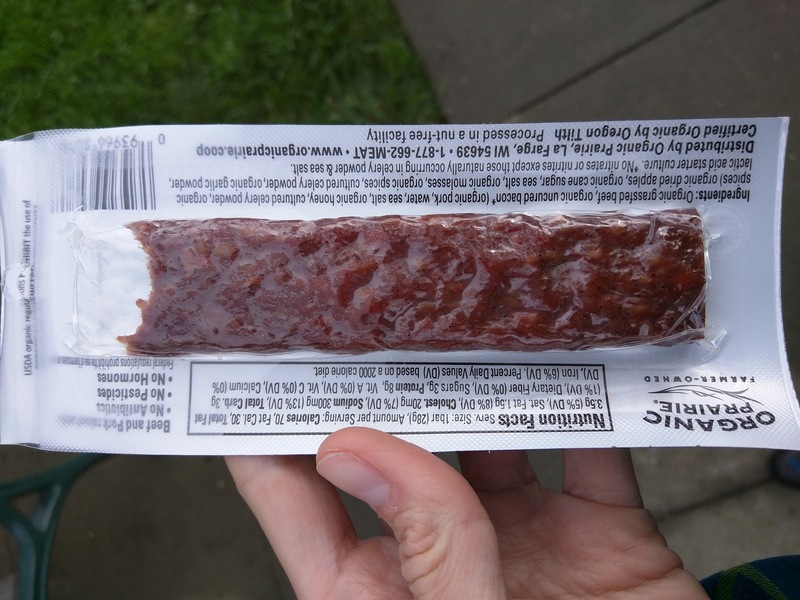 I keep describing these as like Slim Jims, but, the form factor is more like a slice out of a sausage, rather than a Slim Jim, as it is much wider, flat, and fairly thin. The texture was good, just a bit of a chew to it, not enough to require gnawing. The meat seemed quality, no gristle. 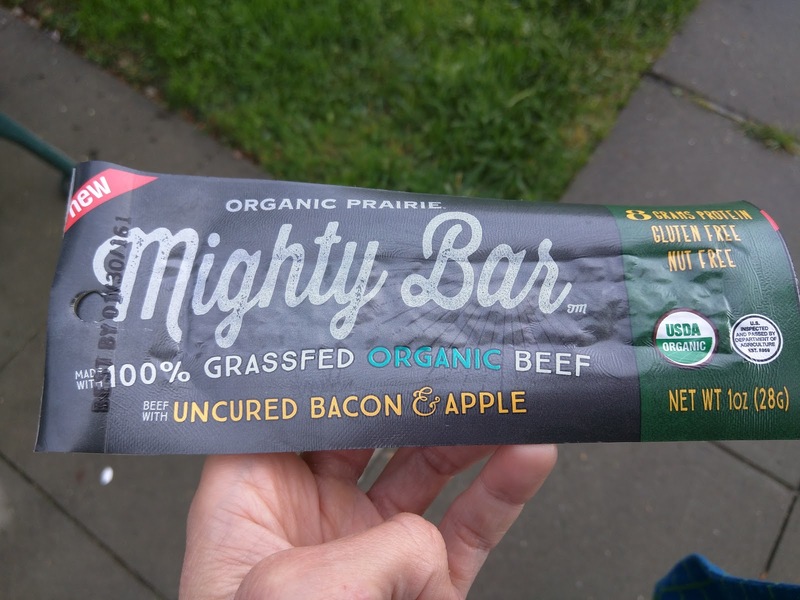 The flavor was great, you could certainly pick out the bacon, some garlic, and a touch of sweetness from molasses, in addition to the apple. I was quite satisfied with this, and would gladly eat another, when the mood strikes to just eat some grab-n-go meat. Next I tried the second flavor, cranberry and sunflower seed. It was far less successful. I didn't really like the chew to it, it had a bit too much casing. And, I didn't like the flavor, which I guess makes sense, as I don't actually like cranberry or sunflower seeds much. I couldn't pick them out as distinct flavors, but, there was a bitterness and just strangeness to the flavor that I didn't like. So, I definitely didn't want another of these, but I'd gladly go for another bacon one. Another example of bacon does make just about everything better. 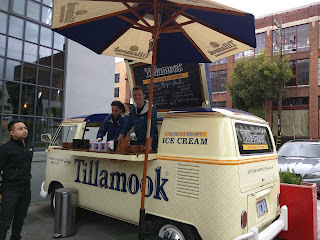 About year or two ago, I became aware of the Tillamook brand due to their catchy "baby loaf bus" commercials, and the ensuing drama when someone stole a bunch of them (yes, for real ... go read about it). But, I thought they just made cheese. I like cheese, don't get me wrong, but, cheese is cheese (unless it is Brillat-Savarin of course, swoon), and not something I get THAT excited about. But, it turns out Tillamook makes more than just cheese. They also make yogurt, sour cream, butter, and ... ice cream. Now we are talking. They've even made it since 1947. They sell standard cartons of ice cream at the supermarket (1.75 qt size), plus "Tillamookies" (ice cream sandwiches with wafer cookies like waffle cones as the cookies), and "Tillabars" (chocolate coated ice cream bars on sticks). But this isn't a story about any of those products. In February 2016, they are launching a new product line of ultra premium ice cream, gelato, and custard, available in pint sizes too. And, to promote their new products, they sent out ... the baby loaf bus! I was walking past The American Grilled Cheese Kitchen, when I spied ... yes, a baby loaf bus parked out front. It was a cold, almost rainy day, and totally not ice cream weather, but, that didn't stop me. Luckily for me, it seemed to stop everyone else, and there was literally no line. No line, and free ice cream? WHAT?! I stepped right up and ordered the one that sounded most interesting to me, the Marionberry Cheesecake Custard. 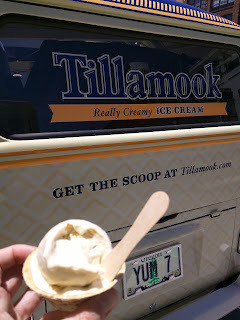 After dishing out a full scoop, not just a tiny sample as I expected, the friendly Tillamook staff member said, "and what else?" I was shocked, not only were they giving me a full scoop, they wanted to know what other flavors I wanted? I hesitated a moment, knowing it was late in the day so I didn't want caffeine, so I ruled out the obviously caffeinated coffee flavor and the dark chocolate, and settled on the hazelnut chocolate gelato. The server asked if I wanted any others, and I said no at this point, quite happy with my two scoops. Amusingly, the guy who strode up to line after me, did opt to get a scoop of all 4 flavors! 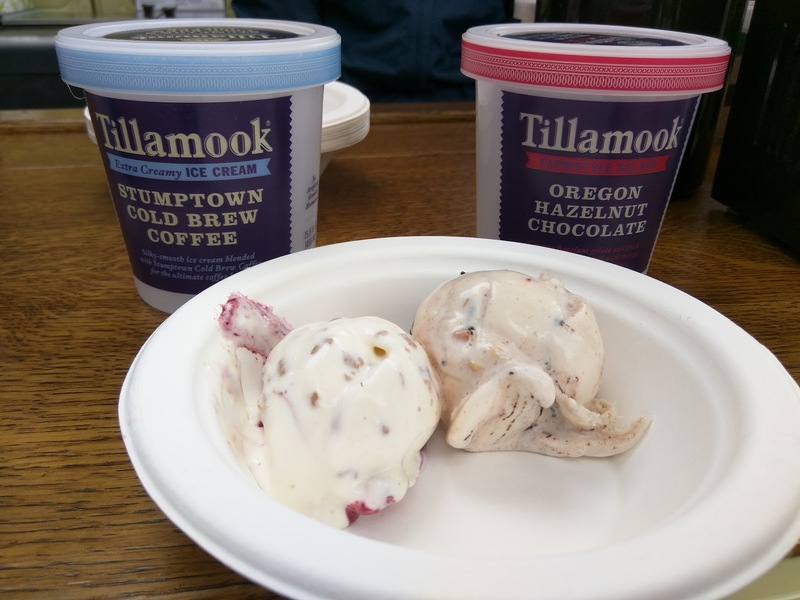 "Sweet mascarpone frozen custard swirled with an Oregon marionberry ripple and pieces of graham cracker crust." I started with the Marrionberry Cheesecake Custard. 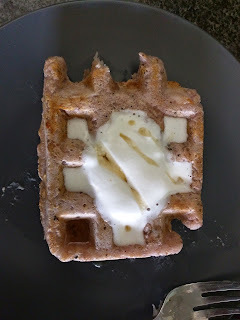 It had lovely swirls of marionberry jam, and bits of graham cracker crumble. I didn't really taste cheesecake, but the texture was very smooth in the base custard, it melted pefectly, and I liked the bits of crust for crunch and the fruity swirls. The distribution of ingredients was great. I wasn't in love with the flavor though. "Creamy hazelnut gelato and thick chocolate fudge, topped with morsels of roasted Oregon hazelnuts." I moved on to my second choice, the hazelnut chocolate. I ended up loving this one, which is interesting, as I don't actually really care much for hazelnut. The base of the gelato was again great, a rich, creamy texture, that melted really nicely. It was loaded with quite a lot of hazelnut. 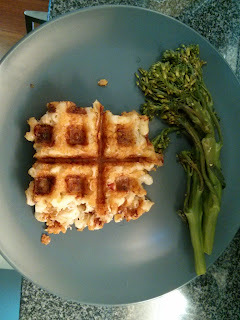 The pieces of nut were the perfect size too, adding plenty of texture and crunch, without being too big and hard to eat. The real winning element for me however was the chocolate fudge swirl. Just like the marionberry jam swirl, it was a generous swirl, this time of rich chocolate. I loved it. I really enjoyed both flavors, and the care that went into crafting the ingredient mix was obvious. Each bite left you wanting more, another bite with crunch, another bite with a fruit or jam swirl. Maybe, just maybe, I really could have tried all 4! California Pistachio Farmhouse Gelato. June 2016. "Creamy, nutty, and truly indulgent pistachio gelato with the perfect hint of sea salt." And ... the baby loaf bus came back! A few months later, during the actual summer. 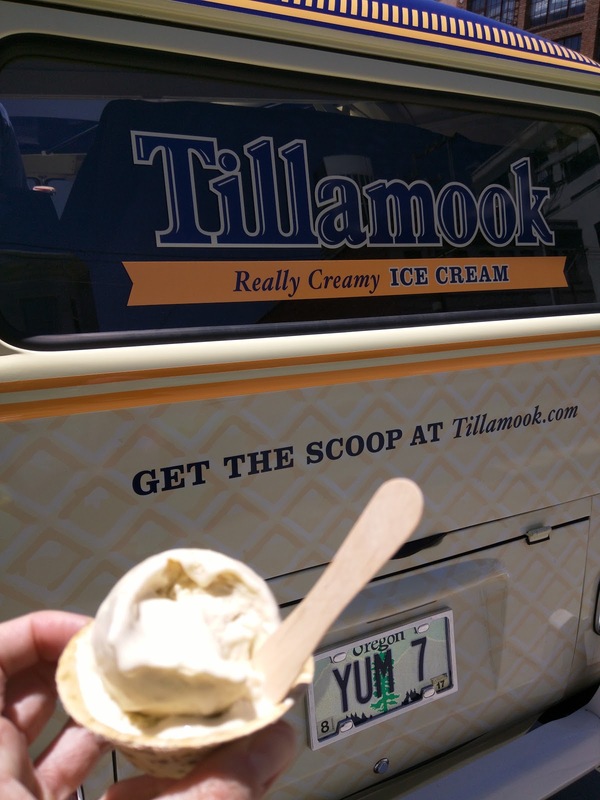 It was perfect ice cream weather, and I was thrilled to see the bus. They had three choices this time, the same Stumptown coffee and Marionberry cheesecake as before, but this time, no hazelnut chocolate (darn! That is what I wanted again! ), so, I went for the pistachio, made with California pistachios. It was perfectly melty, and had a slight pistachio taste, but, there was something about it I didn't care for. I'm really not sure what it was, but it had a bit of a funk to it. Still, very creamy, nicely made gelato, just, not in a flavor I wanted. I recently had a layover at DFW. By now, you probably know how I operate when I visit a new airport: I figure out what terminal I'll likely land in, and which I'll depart from. I research the food options. I have a plan of attack ready long before I hit the ground. In this case, I was flying on American Airlines, and expected to both land and take off from Terminal A, which was great, as it seemed to have the best food options. I also had ample time between my flights to sit down and have a real meal. I planned to go to Pappadeaux Seafood Kitchen in Terminal A, for a full, sit down meal. The restaurant gets 4.5 stars on Yelp, with hundreds of reviews ... yes, for an airport location. That seemed unfathomable, and, even better, they serve seafood, one of my favorite cuisines. I was excited, and had a great plan. Or ... so I thought. Then, strike 1: My inbound flight was delayed for nearly two hours, cutting my connection time short. Strike 2: My outgoing flight was moved to Terminal C. Doh. Original plans out the window. Of course, I found this all out while I was en route, with wifi on board, so I had time to do some quick research to come up with a new plan. I'd just pick somewhere in Terminal C instead of my original, sit down, full dinner plan in Terminal A. But ... the pickings in Terminal C were slim. McDonald's. Wendy's. Pizza Hut Express. Etc. There was basically nothing I wanted. And obviously nothing that compared to my plan to go to Pappadeaux. I started scheming, and came up with a plan B. We'd walk right by Pappadeaux Seafood Kitchen on our way to the next terminal, so, what if I called in my order as we landed, and grabbed it on the way by? If I ordered cold food, and, they prepared it fast, this might just work. Sure, I couldn't get the same items I'd get for dine-in, but, compared to the other options in the terminals, it sounded like a far better option. And indeed it was. The plan worked like a charm, as they had their togo menu published online, along with their phone number, and even a banner invitation to call an order in. They encouraged me to do this! Anyway, Pappadeaux Seafood Kitchen is actually a chain, although I had never encountered it before. They do have a full restaurant at DFW, but, I can't comment much on that, nor on any of their other locations. 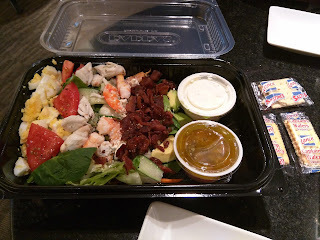 What I can say, is that for airport takeout, it was a great choice, as I was happy with both my salad and my dessert, and I'd gladly return (although, hopefully this time for a real meal). Since we were getting food to go, and hoping to eat it about 20-30 minutes later, we opted to just get cold food, which was a shame, since I really wanted the crab cakes. And the parmesan crusted flounder. And the baked Icelandic cod with lemon garlic butter. And the blackened catfish. And the seafood platter with crab cakes, scallops, and fried seafood. Omg. Alas, we didn't have much time, so getting our order to go was a necessity, and we opted for cold food only. Our options for cold dishes were several cold apps, like crab or shrimp cocktail, or crusted ahi, plus a bunch of salads. While I was disappointed by not getting the hot seafood options, the salad line up was actually quite tempting too. There were simple salads, like a dinner salad, Caesar, or Greek, all of which could have shrimp or lump crab added on top. Then there was a very tempting classic iceberg wedge salad, with blue cheese dressing, bacon, tomatoes, carrots, and green onion (to which I'd obviously add seafood). Don't judge, it is a classic for a reason! But, for some reason, Ojan, who I was planning to share with, didn't want a wedge. Continuing through the menu was a lobster and shrimp salad, served atop a mix of greens with mango and cashews, with a creamy citrus dressing, but neither of us really love lobster. There were a few more options, but we pretty easily settled on the Seafood Cobb, as it featured crab, and it also had bacon like I wanted from the wedge. We both love crab. Seafood Cobb Salad, Medium, $16.99. bleu cheese, avocado, tomato & chopped egg, drizzled with vinaigrette." The presentation of the salad wasn't amazing, but, hey, it was takeout. We opted to have the dressing on the side for two reasons - one, I didn't want it to get soggy, or come overdressed. But also, the Cobb salad normally comes with a Greek-ish vinaigrette, but that is just not my style. I'm all about creamy, indulgent dressing. Salad can't be healthy! (Yes, I fully realize, that even with a healthier dressing, a salad with loads of bacon, blue cheese, and avocado is not exactly a healthy choice ... ) But Ojan loves Greek salad, so I asked if we could get both that dressing that was meant to come with it, plus an additional side of ranch for me. My request was easily accommodated, and we were provided with full containers of each. Our bag also came with some crackers in it. Random? Anyway, the salad. The greens were fresh and crisp, a mix of iceberg and baby spinach, as promised. Nothing fancy, but I have to say, sometimes, iceberg and ranch just really hits the spot. And this really did hit the spot. Also in the mix was red onion for some bite, carrots, and thin slices of zucchini. The zucchini was really quite good, nicely seasoned, and, although a bit random in the salad, I loved it. The tomatoes were bright red and juicy, and actually had some flavor ... in December. I was really impressed with the veggies in the salad, and quite enjoyed dunking them all in my ranch. Oh, and I did love the ranch, super creamy, horrible for me, and delicious. There was a generous amount of protein in the salad too. 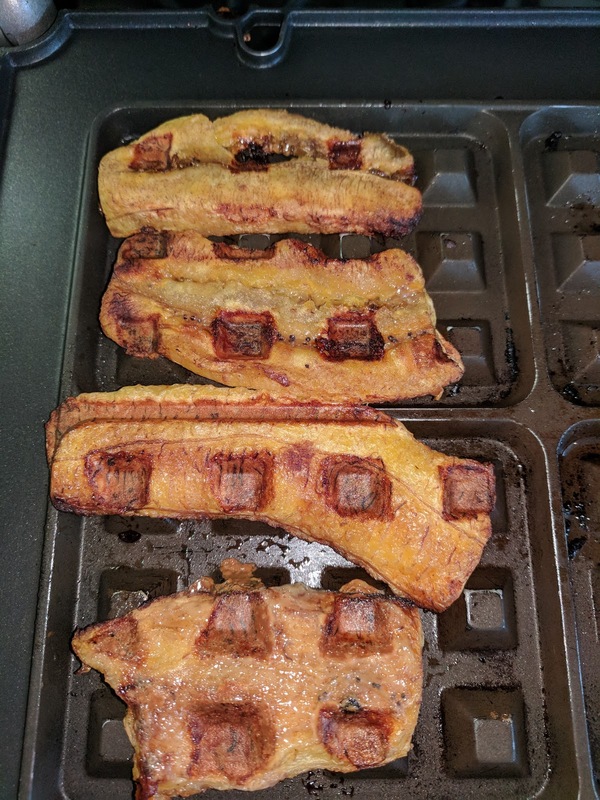 The bacon was a bit oily, but nicely crispy, and in great size chunks, not just little bits. The bacon went great with the dressing, as did the egg, hard boiled, chopped into chunks. And ... the seafood. The chilled, lightly poached, shrimp was well cooked, not fishy, deveined, fine. Shrimp isn't ever all that exciting to me, but, this was clearly fresh and decent quality. The crab was lump meat, and again, nicely cooked, fresh seeming, not fishy. Overall, this was quite good, and very satisfying. Fresh, crispy veggies, quality ingredients. Far, far superior to the takeout crab salad we got from Legal Seafoods at the airport in Philadelphia. The salad was available in two sizes, medium for $16.99 or large for $23.89. I read many reviews of how large the salads were, so, we opted for the medium option. It was a generous salad, but, $16.99 did seem a bit high, even with the seafood. We limited ourselves to cold food, but, that can still include dessert, right? Of course! For dessert we had several options, including a key lime pie with graham cracker pecan crust (meh, lime), vanilla cheesecake with strawberries (tempting, but not that original), a fudge brownie sundae (never my thing), or .... sweet potato pecan pie. Omg. Sweet Potato Pecan Pie. $7.35. Our visit to DFW was on our return from the east coast, where we had been visiting for Christmas. This means that I spent the previous two weeks eating tons of sweets, and in particular, pies, basically every single day. 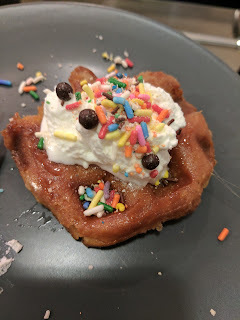 My mother goes a bit crazy with the sweets when I am in town, and I can't even tell you how many slices of pie, sticky buns, decadent bread puddings, etc I had while I was there. You'd think I would have been crazy sick of sweets, and pies in particular, but ... you know me, I can't ever resist a dessert! Plus, this sounded interesting. Sweet potato and pecan, in one pie? I took my first bite, and ... it wasn't love at first bite. The top layer was pecans, toasted, like a classic pecan pie. 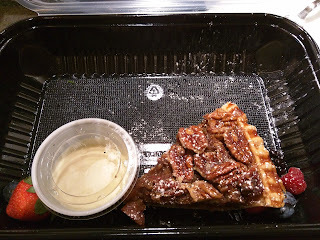 Under that was a thick, gooey layer, somewhat like a classic pecan pie, but thicker, and not quite as cloyingly sweet. Somehow I expected something more like pumpkin pie, just, sweet potato, not something as sticky as this. I didn't dislike it, but, it took a few bites for it all to sync in. 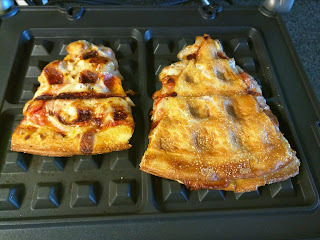 The crust also wasn't amazing. 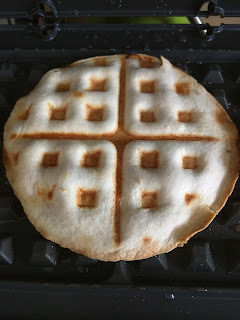 It was fine, but not a flaky, amazing pie crust like you'd get a great bakery, or homemade. It was a bit hard, but not burnt. Not exciting, and clearly not super fresh. 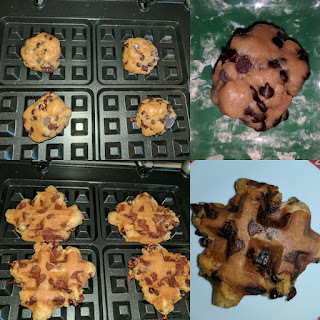 After a few bites, I stopped, disappointed. I decided to try whatever was in the little container on the side. When served at the restaurant, the pie comes with vanilla ice cream on the side, and, the takeout menu also said it came with vanilla ice cream. I was glad to see that they didn't serve it with ice cream, since we didn't eat it immediately. Instead, it was served with what tasted like boozy crème anglaise. I won't ever say no to crème anglaise, and the boozy (bourbon?) flavor went nicely with the pecans. The crème anglaise, plus my renewed expectations, transformed my experience of polishing the pie off. I dunked every single bite into the crème anglaise. I broke off the back crust, thinking I wasn't going to eat it since it wasn't great, and then realized I did want it ... if I could dunk it in the crème anglaise too. The pecans never grew on me, perhaps because I just had way too much pecan pie and pecan sticky buns over the course of the previous week, but the sweet potato filling, crust, and crème anglaise did turn out to be pretty satisfying. The shocker though was the fruit served alongside. The strawberry wasn't very ripe and I didn't try it, but the raspberries, blueberries, and blackberries, like the tomato, were shockingly ripe and flavorful, particularly for December. So in the end, I was happy with my dessert. The fruit was tasty, I enjoyed my pie, and literally licked the crème anglaise container clean at the end. Far more successful than other airport dessert takeout options I've had, like the lackluster cheesecake from Romano's Macaroni Grill at ORD or the Boston Cream Pie from Legal Seafood in PHL.